Rules of Play Music | We play by our rules. 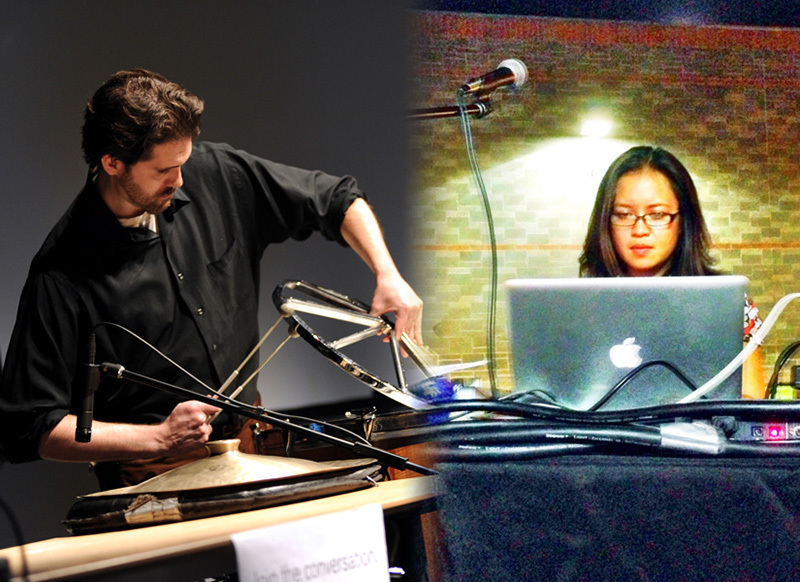 Rules of Play is LISA TOLENTINO and ROBERT ESLER, an experimental music duo for voice, percussion and electronics. Our works are based in live performance, crafted out of an artistic interplay between contemporary music, storytelling, and digital media (computer programming, electronics and visual media). Our influences are many, but our aesthetic builds upon a framework of polyrhythmic structures, repeated patterns, noise textures, multi-layered metaphors, and the real-time manipulation of female vocals. We have been playing together since 2003. We hope to be playing until 2063. Robert Esler and and Lisa Tolentino. Photos (left) by Tim Trumble, 2012 ASU Herberger Institute, EMERGE Festival and by (right) Jaime Glasser, 2013 i.d.e.a. Museum, Mesa, Arizona. Robert Esler is a musician, maker and teacher. His doctoral work focused on the confluence of art, science, and music. He currently teaches courses in popular music, audio production and sound design at Glendale Community College. Lisa Tolentino is a musician, media artist, and educator. Her doctoral work focused on designing media environments to develop the inner potentials of youth with with autism. She currently teaches interactive visual media and sound design courses at Phoenix Country Day School and is developing a program for interdisciplinary work. Please visit our site again soon for upcoming performances, media clips, repertoire / experimental cover songs, and original works.